Few things compare to the deliciously sweet taste of a perfectly ripe pear. And for around $2 per pound, what’s not to love? But what happens when they’re past that point of ripeness? You know — when they start to form brown spots, and become mushy and unappealing. Don’t throw away those mushy pieces of fruit! Here are 11 recipes that are perfect if you’re wondering what to do with overripe pears. Do you love to make smoothies? Yes? OK, good, because overripe fruit is perfect for freezing and using in smoothies. Cut off any parts of the pear that have gone bad, cut up the rest of the fruit, seal it in a zip-close bag, and put it in the freezer. 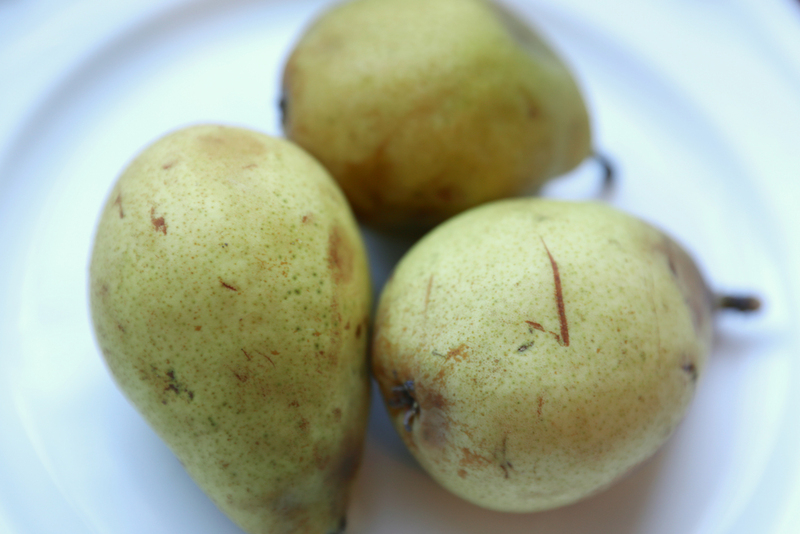 If your pears are just slightly overripe, you can cook them into a pear jam. You need a lot of pears for this recipe — about 3 pounds — but the only other two ingredients are lemon juice and sugar. Store the finished product in Mason jars, and spread it on toast, desserts or yogurt, or even cook it with some meat. There are so many ways to use jam it’s not even funny. Pear crumble is not only delicious, but it’s also easy to make — besides pears, the rest of the ingredients are things you should already have around the house. For this recipe, the mushier the pears, the better. Kitchn.com suggests mashing your browning pears and using them as a pancake topping or folding them into your batter. Fruit is always a delicious complement to breakfast foods. You could also use the mashed pear on top of ice cream. Sundaes, anyone? Blend them with some olive oil, vinegar and seasoning for a salad dressing that’s a little on the sweet side. Perhaps try out this delicious pear vinaigrette. Hint: The sweetness pairs well with salty toppings. This is pretty much a homemade Fruit Roll-Up. Slow-bake your fruit into a pear and cinnamon fruit leather. Although it does take a while in the oven (six to seven hours), it looks pretty worth it. Check out the finished product, as well as the raving reviews about how yummy it turns out. Who doesn’t love ice pops? There’s no baking required for this recipe — these spiced ginger pear frozen pops only require a blender and some ice pop molds. You could get also creative with this and add in whatever fruits or flavors you want. Do you like fruit and wine? Make some adult frozen pops with Riesling and overripe pears. These sound amazing for a summer party or even just an afternoon treat. This Vanilla Spiced Pear Butter goes perfectly on toast, muffins, oatmeal and ice cream. This recipe uses 7 pounds of pears and yields 4 pints of butter, but you could halve or quarter the recipe. If you’re feeling ambitious and decide to make the full recipe, you can freeze the rest and have pear butter year-round. If you love to bake, use your overripe pears for pear and cinnamon muffins — this one’s fun to make with kids. Much like mushy brown bananas make for delicious banana bread, mushy pears are great for pear bread. I’m not one for baking, so I’m not sure I could conquer the above pear muffins and bread, but this cocktail? It looks too delicious to not give it a try. Using the past-its-prime pear, smash and strain your way to this pear bourbon smash cocktail. Instead of applesauce, try some homemade pear sauce. All you need besides pears is sugar, lemon juice and (optional) cinnamon spice. You could make a large batch and freeze some to use as easy healthy snacks. Your Turn: What’s your favorite thing to make with overripe fruit? Jacquelyn Pica is an editorial intern at The Penny Hoarder. She has a bad habit of forgetting about the fruit she buys and only re-discovering it once it gets mushy.